It makes sense but is unfortunate that the days so packed with stories and photos are also the ones I don't have the opportunity to write. That means I began composing this entry about our busy Saturday on the following Tuesday, which happened to be our last full day in Kenya, nearly completed it on Thursday morning in Amsterdam, and am finally finishing it on Monday the 24th from our dining room table at home in Wisconsin, having (mostly) caught up on sleep. Even so, this will have to be a two-part entry. Darn! Saturday began VERY early. Harry and I woke at 5:00 a.m. and bustled around packing last-minute stuff and making our morning drinks. We waited until 5:27 to wake the boys, wanting them to wring every minute of sleep from the day. Ezra hopped right up and began dressing and talking simultaneously. (When he has to wake up really early, he functions much like his mother at such times: he wants to talk about his dreams in great detail and he is especially prone to out-loud reflections on the absurdities of life. Lucky Harry!) Nehemiah stayed curled up in bed for a few minutes before groggily and quietly dressing. Both boys snapped into full animation mode when they got into the van with their cousin Lisa. There was a LOT of early-morning silliness! It was a harrowing journey through a thick relentless fog that persisted for the first hour or so. I tried to choke back my horrified gasps every time a passing vehicle suddenly materialized in front of us, its headlights blazing through our windshield before it veered back into its lane just in time. WHO PASSES CARS IN THESE CONDITIONS?!? It was complete and utter madness. I spent much of that hour alternating between holding my breath and squeezing my eyes shut, praying all the while. Thankfully Mark is a calm and confident driver, and he steered us through the fog safely. 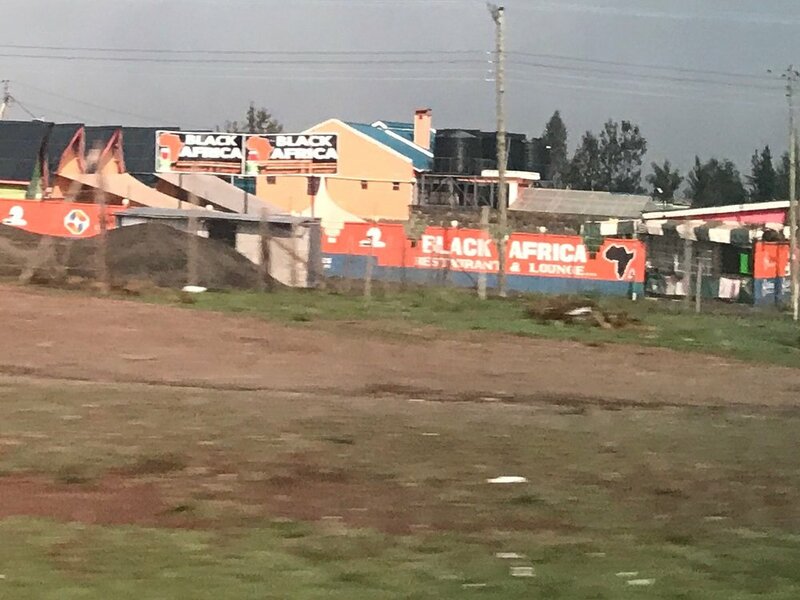 I think we were all relieved, though, when the sun finally burned through and we stopped at Java House in Naivasha to stretch our wobbly legs and get some food. - Top row right: The lake in Nakuru. If we had gone closer, I could have shown you the huddles of pink flamingos at water's edge. 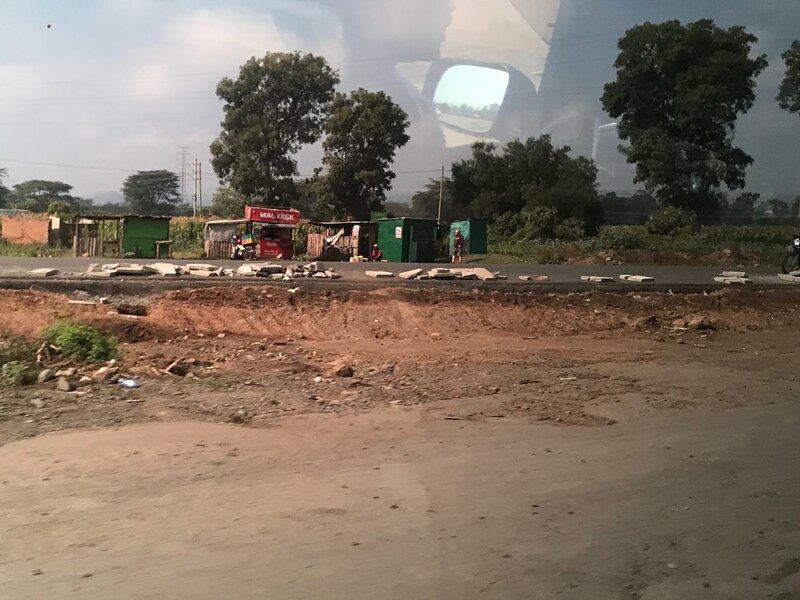 - 3rd row middle: The rocks on the partially-finished road are supposed to prevent people from driving on it (signs don't suffice). - 3rd row right: We stopped at this store to pick up some supplies like flour, sugar, etc. It's customary to bring such supplies when visiting an older relative like Guka, especially one who lives so far from a store. - Last row: These shots were all taken on the dirt road to Guka's. One of my favorite scenes happened as we approached Guka's. From a distance I had seen a group of maybe 25-30 people gathered alongside the road where a fence and some thick hedges created a cozy backdrop. The people were busy doing something and they all seemed to be chatting happily. I was going to avert my eyes as we got closer just so they didn't feel like they were on display, but Shiru drew my attention to them. "Do you see? They're drinking tea!" And sure enough, there were pots and urns, and people were pouring and sipping and gabbing and laughing, and it just looked like the best time! Everyone glanced up as our van passed, and many flashed warm smiles or threw up hands in greeting. I couldn't — or wouldn't — take a photo; it would've been too invasive and broken the magical spell. But that scene will live in my spirit for quite some time. Guka's land is beautiful. I don't know exactly how far it stretches, but he owns most (all?) of what we could see from his yard. His property consists of many different dwellings, each with timber exterior and plywood-type interiors. (Harry told me that when he visited the property as a child, the walls were covered in newspaper. Where climate is not a concern, newspaper is sufficient.) 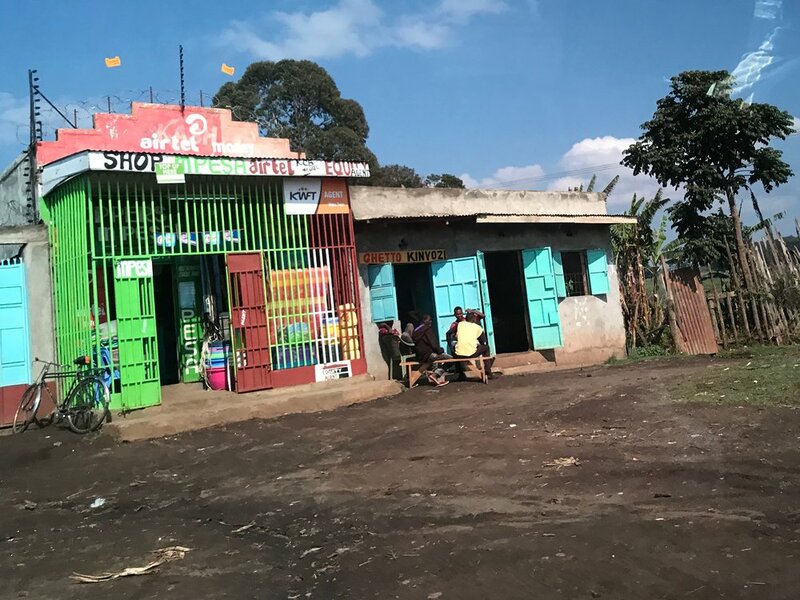 The hut on the left, just inside the gate (pictured top left, immediately below) is the home where Guka's second wife and children lived. 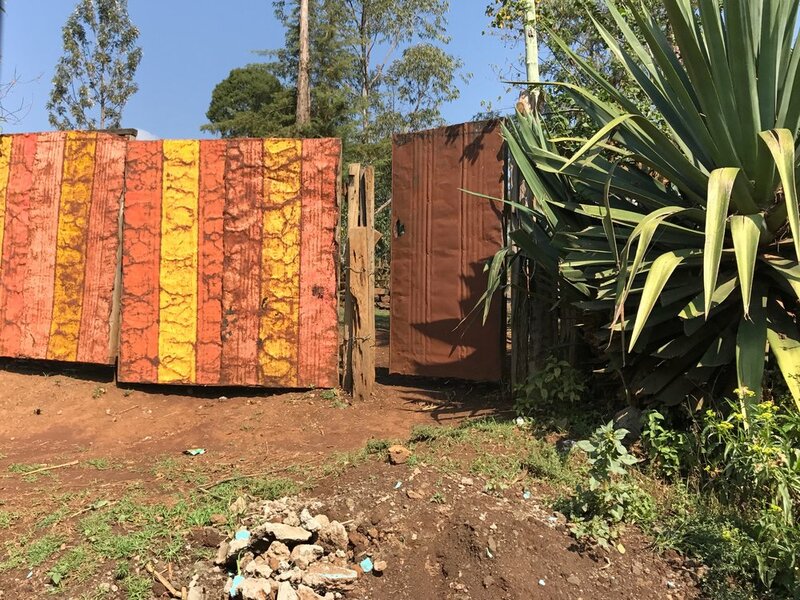 Then there's a building that houses the kitchen for the second wife's family (that building is not pictured here) and a separate building with the chicken coop (top left, second set of photos), then a fence and a latrine for the second wife's family. Further down the hill is the house with the living room where we spent most of our time, which is flanked by two small rooms (one where Cucu sleeps and one where she keeps her meat and some supplies). Then comes the building with her kitchen, another with her chicken coop, then a small garden and the building with her latrine. (The latrine is literally a hole in a dirt floor.) The building near the sheep fence (pictured top right, immediately below) is the granary, where maize is stored. As soon as Harry told Guka that we would be coming to visit, Guka announced that he would slaughter a goat for us. This happened last time we visited also, and it's greatly honoring that he would do this. He, his best friend, and the men who work the farm carve the goat, as shown in that top right photo below. 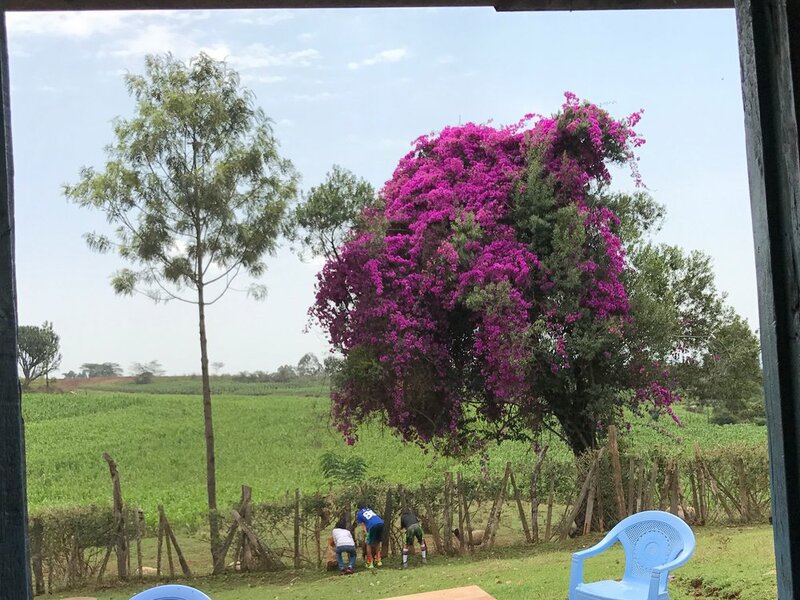 Lisa and the boys had a great time running around the yard, chasing chickens and each other, peering at the sheep and cows in the nearby paddock, and listening to Guka talk animatedly in Kikuyu. (It turns out he was telling some uncomplimentary stories about various people, criticizing them, but you would never know it because he had a bright smile on his face the whole time!) One of the jokes he made (we chose to consider it a joke) is that from the moment of marriage, a wife is compiling a "black book" of all the wrongs and mistakes by her husband, just waiting for the moment to reveal it all. Cucu, sitting quietly beside him while he talked, waved away that story with a bemused frown. Nehemiah tried and loved everything, especially the tea. Ezra tried most items but barely tasted them. Lisa even tried a kidney! Before we left, Guka insisted on giving us part of what remained of the goat, so he pulled out his panga (huge machete-type knife) and carved off a huge slab for us to take! How do cats know who hates them?! It's universal! It was an amazing visit. So worth the time and logistics. I'm really glad we went.